The Art of Defence and Pursuit, With the Small-Sword. Described in a Dialogue between a Scholar and a Master, of that Art. 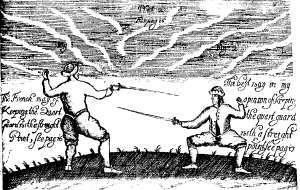 This was Sir William's first text, written at the age of 27, and contains all he knew at that time about the common method of small-sword fencing. It is therefore a useful resource for those interested in the common method, particularly as it contains a meticulous description of standard lessons (or 'bottes'). A lot of material found in his later work, even the hanging guard, can be found here, but it lacks the focus of the Vade Mecum and New Method.